The Rec 5 area just west of Sweeney Hall went under the blade of the bulldozer earlier this summer. 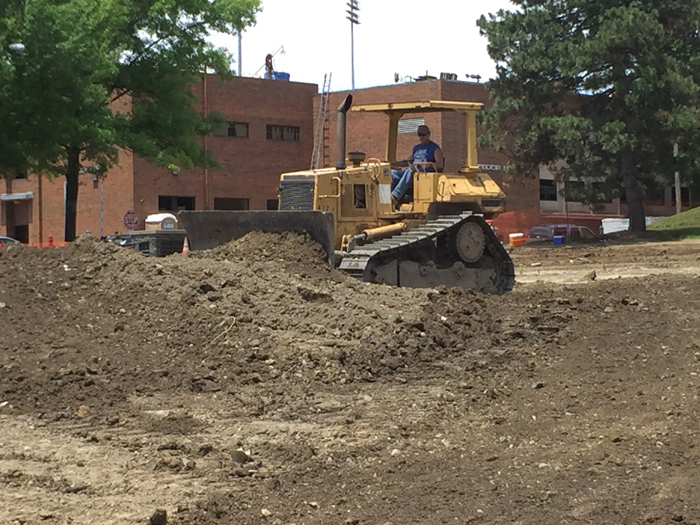 Crews are busy across campus this summer working on more than $12 million in improvements, from restroom renovations and roof replacements to expansion of the electrical substation and creating new lab space in Moser Hall. The vast majority of the repairs are funded through state capital dollars. The biggest project is renovations to Melnick Hall. The $4.65 million improvement will allow for the relocation of the YSU Foundation and WYSU 88.5 FM to the building, said Rich White, director of Planning and Construction. Construction is expected to be finished by the end of the year. Meanwhile, the Rec 5 area just west of Sweeney Hall has been overhauled. Retaining walls, fencing and the asphalt surface have been removed. White said grass will be planted and the lot will be campus green space. A small basketball court will be built on the northwest corner of the lot. In Moser Hall, space on the first floor is being renovated for an advanced manufacturing lab. White said the project also includes construction of offices on the third floor of Moser, where offices for Physics faculty will move from their current location on the lower level of Ward Beecher Hall. Other summer projects include: elevator safety repairs and replacements in DeBartolo, Ward Beecher, Bliss and Moser halls; restroom renovations in Tod, Bliss, Ward Beecher and Sweeney halls; upgrades and expansion of the university’s electrical substation; replacement of damaged concrete drives, walkways and steps; replacement of portions of roofs on Tod, Moser and Fedor halls; repairs and preventative maintenance to the Wick and Lincoln avenue parking decks; and repairs to masonry exteriors on Bliss and Moser halls and Stambaugh Stadium.